2.) 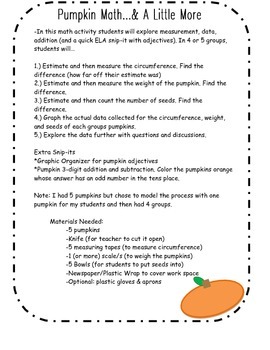 Estimate and then measure the weight of the pumpkin. Find the difference. 3.) Estimate and then count the number of seeds. Find the difference. 4.) 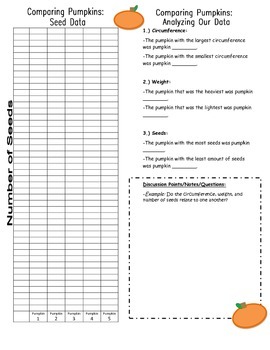 Graph the actual data collected for the circumference, weight, and seeds of each groups pumpkins. 5.) Explore the data further with questions and discussions. 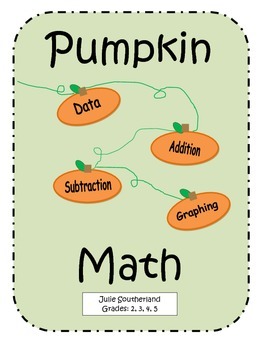 *Pumpkin 3-digit addition and subtraction. Color the pumpkins orange whose answer has an odd number in the tens place. Note: I had 5 pumpkins but chose to model the process with one pumpkin for my students and then had 4 groups.